Happy Monday, beautiful people! First off, I'd like to say a huge thank you to everyone who linked up last week for the first ever Mani Monday!! Heather and I loved seeing your amazing manicures, and we can't wait to see what you link up this week! Here's what I'm wearing this week....don't judge too hard, this is after 10+ days of wear, and right after I went a little crazy with the nail clippers. Whoops! Great job, Denissa, these are adorable! Now it's YOUR turn to link up! I can't wait to see what you've done and can't wait to feature one of you next week! Please grab a Mani Monday button and show the love, and don't forget to come back next week for a special Mani Monday that includes a giveaway! 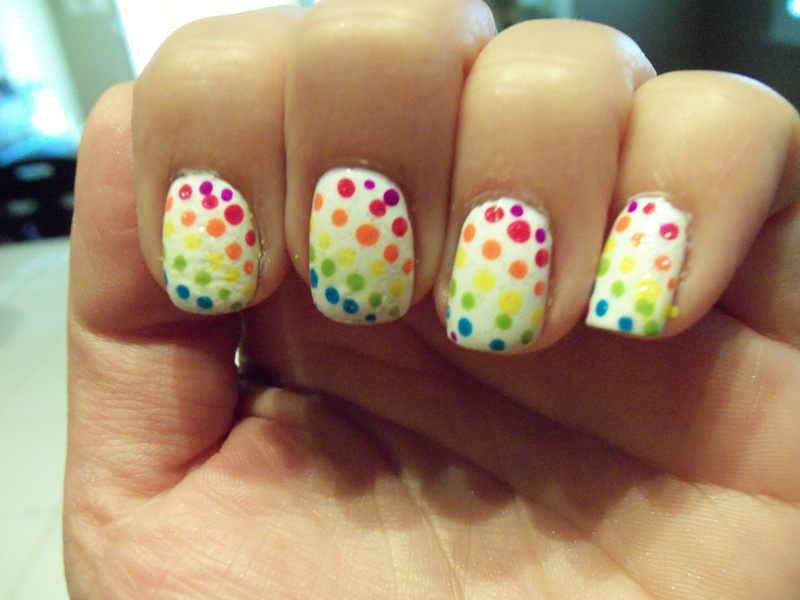 I love Stevie's dots - may have to give this a try. 10 days!??!? That's awesome! I of course love the pink shade too! Thanks for hosting, LOVING it!! Just checked out the links- fantastic. Thanks for hosting! Thanks for hosting! I love the rainbow dots :) I'm your newest follower!